For me, it might be a pristine private preserve, with miles of neat, Nordic track trails twisting up and down over snow on deep hillsides forested with hemlock and hardwood. Crossing clear running brooks and offering just enough up and down to provide aerobic exercise and gliding thrill, each trail loop is long enough to let an active XC-skier work up an appetite in an hour or two. Set on 1,280 acres near Bradford, Glendorn's "Big House" now welcomes guests even in winter. That appetite is important. Before long another superb meal of superlative cuisine and good wine is being graciously served in the cathedral-ceilinged great room of an elegantly rustic redwood lodge. 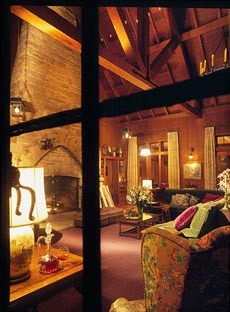 A stack of long logs blaze in the huge fireplace and two-story cut-stone chimney that dominates one end of the room. Afterwards, port and brandy are served in the billiards room, and there is pleasant conversation with interesting strangers. When I've had enough of those pleasures, I retire to my own perfectly decorated bungalow by a brook in the woods, to relax around a crackling fireplace in perfect serenity until I drift off into a deep sleep. Now imagine being able to enjoy that heaven without having to get on an airplane or even leaving state. In reality, this XC-ski sanctuary is located in Western Pennsylvania, mere minutes from the University of Pittsburgh. The Bradford campus, that is. When the great wrought-iron gates swung open as we arrived at Glendorn several weeks ago, my wife, Sari, and I both realized we were entering someplace special, an impression immediately confirmed on the half-mile drive up to the main lodge. Snow had been falling steadily all day, and our 180-mile journey up from Pittsburgh had taken twice as long as it should have. Two times accidents well ahead of us on the highway stopped traffic dead, once for more than an hour. We were fairly frazzled, but the cottony snow that lined the brook-side drive was somehow different than what we had struggled through all day. This snow was serene, even inviting, and as we pulled into the small lot aside the huge, rambling log structure, a smiling man stepped out to welcome us. This 1,280-acre estate was the creation of Bradford businessman Clayton Glenville Dorn. A native of north central Pennsylvania, C.G. Dorn had sought his fortune in the fledgling oil industry of the 1880s, working as a broker for John D. Rockefeller in the Bradford area. Eventually, C.G. and his only son, Forest, developed a process to extract oil from wells considered depleted. By injecting water into a well's rock formations and then pumping it out, they were able to recover more oil. In 1916, the Dorns founded Forest Oil, which quickly became an authority in secondary recovery systems and within two decades the country's largest producer of Pennsylvania Grade crude oil. The family prospered. C.G. was an avid outdoorsman who, after all, named both his son and his company Forest. In 1928, having come to love the landscape where he lived and wanting to establish a "summer camp" compound for his heirs, he acquired a large tract of land four miles up a side valley from Bradford. Encompassing two headwater streams, a small cabin and his favorite fishing spot, the land, like much of northern Pennsylvania, had been clear cut. C.G. had his property boundaries fenced and proceeded to encourage the native forest and species to recover. Streams were cleared, fishing ponds built and hiking trails established. He added on to the cabin but soon felt the need for something larger to accommodate his friends, business associates and family, which had been expanded by eight grandchildren, who affectionately referred to him as "Bondieu." The catherdral-ceilinged Great Room of Glendorn's Big House is the estate's center of activity and fine dining during the winter. A year later, C.G. had a large and elegant, though by no means palatial, redwood lodge erected in the center of the glen, with four bedroom suites and a magnificent two-story great room with lots of windows and a massive cut-stone fireplace and chimney. A large heated swimming pool, tennis courts and shooting range were added, along with other family-entertainment amenities. C.G. died in 1936, but his son shared his deep affection for Glendorn as a family gathering place. Rather than fitting more additions on to the Big House, Forest had a charming brick bungalow built on a brook-side bank for his daughter's marriage. Additional rooms were added as her family grew. That residence came to be called "the Roost." In 1939, to provide a refuge away from the raucous energy of the Big House, Forest built a small perfect cabin for himself and his wife on a wooded hilltop. That became "the Hideout." Over the next decade, nine other beautifully designed residences were built to accommodate additional Dorns. All were carefully crafted by local artisans using polished wood and cut stone, with fine features and fittings, decorated to reflect their owner's esthetic. Each had a characteristic color theme, the specific hue created for its original owner's preference. All the residences have been lovingly maintained. From spring through late fall for the next four decades, Glendorn was the expanding Dorn family's haven. Home movies from the 1950s show flocks of children frolicking in the heated swimming pool or casting fly rods on ponds and streams, watched by smiling, playful adults. A former Olympic swimmer was hired to coach the family swim team, and an old-fashioned ice cream parlor was installed pool-side. And the Dorns also entertained, with an eclectic guest list that ranged from Ella Fitzgerald, Art Buchwald, Louis Armstrong and Victor Borge to George H.W. Bush, long before he became president. With the passage of time, however, the family grew, and many members moved west, following the oil business from which they had earned their good fortunes. Even Forest Oil relocated its corporate headquarters to Denver in 1992. By then, the difficulties and expense of maintaining Glendorn had become a burden for the now geographically diverse family. After considerable discussions, the decision was made to try to preserve the estate by opening it to the public as a country retreat. Starting in 1995 and following the Dorns' traditional March through November calendar, the estate began accepting well-heeled guests who appreciated the simple charms of a wonderful country estate, along with some great fresh-water fishing. If Glendorn's brooks and ponds weren't enough, guided expeditions were offered into the endless possibilities of the Allegheny National Forest and Lake Erie tributaries. Daniel Abrashoff, Glendorn's general manager, makes it a practice to personally greet most guests when they arrive. There's none of the formality of checking into a hotel, only the pleasantries of a gracious host welcoming friends. After asking whether we were hungry following our journey, he showed us to the Roost, the exceedingly charming country cottage that was to be ours for the next two nights. Almost before the fire was burning in the fireplace, a knock on the door signaled the arrival of a courteous young woman bearing two of the most elegant sandwiches I'd ever seen. She set them on the wooden table by the window looking out into the snowy woods. The image of that table setting was only the first of a succession of Gourmet Magazine culinary tableaus I remember from those two days. We were beginning to feel very relaxed. Several hours later, we wandered up to the Big House for dinner. Rustically elegant, the house remains much as it looked in its heyday of the 1930s, complete with original family furnishings and heirlooms. Flickering candlelight from wrought-iron chandeliers reflects off polished redwood walls. Meals are served on the same Spode china service the family used. As was the family's custom, gentlemen wear jackets to dinner; ties are optional. With the four bedroom suites in the Big House and the 12 other residences on the grounds, up to 50 guests at a time can be accommodated in rustic elegance. Decorated with the family's personal furnishings, pictures and knickknacks that make each house a home, the setting evokes an authenticity that furthers the sense you're the guest of a wealthy, quirky family rather than a paying customer. Indeed, with the reservation confirmation comes a welcoming "Letter From the Dorn Family," offering suggestions about how to enjoy your stay. As awareness of its charms spread, Glendorn earned a reputation as an excellent upscale country escape, garnering a Four-Diamond designation from AAA in 1998, even before the estate was granted a liquor license. As a wedding present for his only daughter, Forest Dorn built the Glendorn cabin known as "the Roost," which features a cozy living room and dining area, in addition to five bedrooms. Two years later, Glendorn became the first establishment in Pennsylvania to qualify for Relais & Chateaux, the association of 440 top restaurants and small hotels around the world that subscribe to the "Five C" philosophy of hospitality: courtesy, charm, character, calm and cuisine. From the White Barn Inn in Kennebunkport, Maine, to the French Laundry in Yountville, Calif., only 27 unique inns and 14 exceptional restaurants in the United States meet the Relais & Chateaux standard. In addition to still being Pennsylvania's only member, Glendorn is the only Relais & Chateaux inn between New York and Minneapolis. In 2001 Abrashoff was hired as general manager. An Altoona native and a 1986 Penn State graduate, he had gained extensive experience in hotel management around the country. He appreciated both Glendorn's family essence and its unique charms. Abrashoff also retained a strong affection for Pennsylvania and its bounties (Glendorn now gets its ice cream delivered directly from the Penn State Creamery). 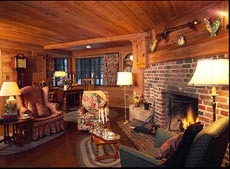 In 2002, Glendorn became an Orvis Endorsed Fly Fishing Lodge, which has only burnished its reputation as a sportsman's paradise. The estate also has earned enthusiastic kudos from various national publications for both its cuisine and country amenities. For example, Travel and Leisure magazine ranked it among the "Top 50 Most Romantic Places in the World" and USA Today "One of the Top Ten Places in the United States to spend in front of a fireplace." But Abrashoff perceived additional possibilities. Although all of the cabins had been equipped for cold weather, the Dorns had traditionally closed the estate during the winter. Abrashoff was convinced Glendorn could work year round, and last winter, he decided to see if he could keep its 41 fireplaces burning. Cross-country-skiers and snow-shoers who appreciate comfort and cuisine should be glad he did. When there's snow falling, I can think of no more excellent place to cross-country ski within such a comfortable radius of Pittsburgh. Glendorn's woodlands are pastoral places in winter, but if the estate's 10 miles of tracked trails aren't sufficient challenge, there are extensive public trail networks, both groomed and ungroomed, a 30-minute drive away. Being open in winter has also allowed Abrashoff to keep his core staff intact. To a person, they are young, personable, gracious, attentive and knowledgeable. Executive chef Jason Guilisano, hired last year, is an enthusiastic Culinary Institute of America-trained talent who during his short career has worked with half a dozen top chefs in well-known restaurants in California, Manhattan and France. Glendorn's nightly rates include all meals, and Guilisano makes sure that each one lives up the Relais & Chateaux standards for cuisine and presentation. Using the finest ingredients carefully prepared with creative flair, and a preference for seasonal and locally grown produce, he presents delightful dishes at every meal. Breakfasts are simple affairs of recognizable standards, eggs, pancakes and French toast, but perfectly prepared to your wish and with subtly creative touches. For lunch there were savory soups and sandwiches extraordinare on house-baked bread. Although individual requests for dinner are welcomed, along with the dozen other diners those two nights, we opted for Chef Guilisano's multi-course tasting menu. A succession of small-portion plates flowed elegantly from the kitchen (see box above), followed by coffee and brandy around the fireplace. Guilisano's kitchen staff is supported by sommelier Nathaniel Dorn (from California, but not a Dorn family member). In just two years, he has assembled a cellar that has received an Award of Excellence from Wine Spectator magazine. Natalie Fabic, a gracious young woman from Georgia, Ukraine, expertly served us at every meal. The easy familiarity they bring to their work enhances the sense of being among friends. Still, it was fortunate we hadn't come the previous week. Early January's uncharacteristic warmth had left the woods bare until three days before we arrived. It had snowed nearly a foot since then, and Damon Newpher, Glendorn's affable multitalented activity director, had been out that morning on the snowmobile setting cross-country tracks through the woods. 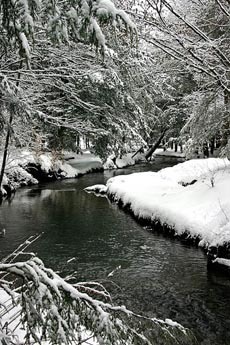 Offering great fishing in the less snowy seasons, Glendorn's Fuller Brook becomes a scene of quiet repose in the winter. By the time Sari and I pushed ourselves away from the breakfast table, we had plenty of places to ski. Since the few other guests who braved the 10-degree temperature were on snowshoes, we had the deeper woods to ourselves. We made our way up along the brook-side trail and over the next two hours nearly worked up a sweat completing the long loop around half of the estate. By the time we arrived back to the Roost, it was almost time for lunch. And what a lunch it turned out to be. Nathaniel Dorn met us in the estate's new Lexus SUV for the five-minute drive up a forest road to the Hideout, the perfect little cottage Forest Dorn had built as an escape from the family bustle below. This is a place of perfect romance. A cozy fire was burning in the hearth and the little table was set for two. Thick slices of still warm French bread, a bottle of good wine and thou; what more could one require? How about mussels in a delicate garlic sauce, a perfectly seasoned green salad and, for dessert, creme brulee. Though the hideout is rented to overnight guests during the summer, we had it to ourselves that wintry afternoon and were for several hours two of the planet's most contented people. The afternoon sky was already fading into evening when we even thought about leaving. Rather than calling for a ride and breaking the spell of the moment, we decided to snowshoe back down through the woods, a pleasant adventure despite being rank novices. All the better to sharpen our appetites for dinner. When time came for us to check out of the Roost the following day, departing was such sweet sorrow. Glendorn's cozy accommodations and excellent food are certainly significant attractions, but a big part of its undeniable appeal is the sense of entitled serenity that pervades the estate. Elegant and intimate without being ostentatious, it still offers a warm, familial embrace to all who enter its gates. Sure, travel editors are often treated with special care, but after speaking with other guests, many of whom have been back again and again, my sense is that at Glendorn, everyone gets that kind of care. I suspect that's the way C.G. Dorn would have wanted it. Depending on the weather and route, Bradford is a 3-to-4- hour drive from the Pittsburgh area. Although not as direct, the highway route is I-79 North to I-90 East to I-86 East to 219 South. Other non-highway options include Routes 8 , 62 and 6 to Warren and Routes 28 and 219 North to Bradford. US Airways also offers several daily nonstop flights between Pittsburgh and Bradford Airport. Upon request, Glendorn will send a driver to meet guests arriving by plane. Depending on which room or cabin you occupy, Glendorn's daily rates range from $495 to $795, plus tax. That includes accommodations and all meals for two people, as well as use of the estate's facilities and amenities. A variety of offsite programs, outings and excursions can be arranged. For an extra fee, dogs are permitted to stay in the individual residences, although not in the Big House. 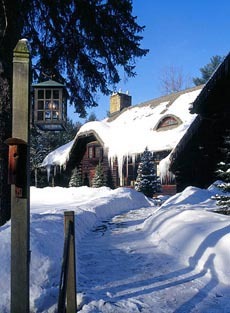 Through the end of March, Glendorn is offering special midweek Winter Interlude rates. If you require more XC-skiing than Glendorn's 10-mile trail system provides, you'll find more than 25 miles of groomed trails a few miles north in New York's Allegany State Park.